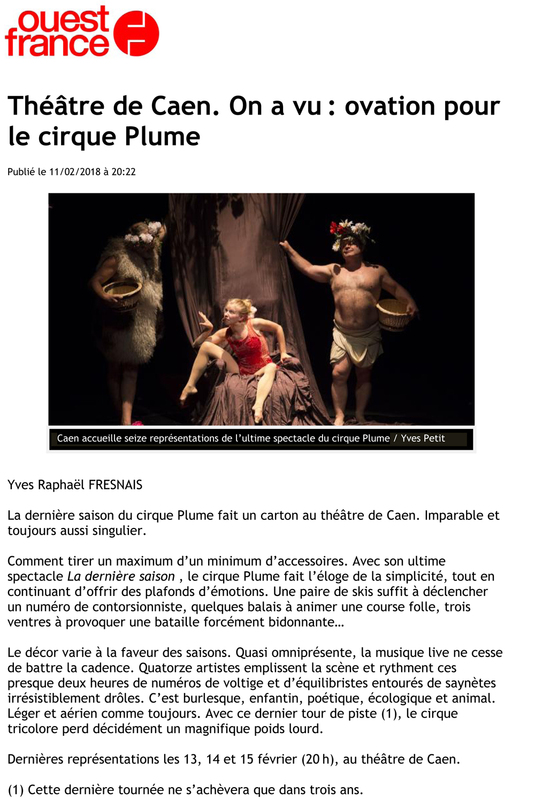 “La dernière saison” by Cirque Plume — infallible and as singular as ever — is a hit at the Théâtre de Caen. How to make the most out of a minimum of props? With its latest and last show “La dernière saison, ”Cirque Plume praises simplicity while continuing to offer emotions through the roof. A pair of skis is enough to spark a contortion number, some brooms enough to animate a crazy race, three stomachs enough to provoke an inevitably hilarious battle. The set changes as the seasons progress. Live music — almost always present — maintains the tempo throughout the show. Fourteen artists fill the stage and punctuate these nearly two hours of high-flying numbers surrounded by irresistibly funny sketches. It’s slapstick, childlike, poetic, ecological and animalistic. It’s as light and airy as ever. After this last round (1), France’s circus will definitely lose a magnificent heavy weight. (1) This final tour will be completed in three years.